Sandia has developed a software toolkit that uses stochastic programming to perform power system production cost model simulations. 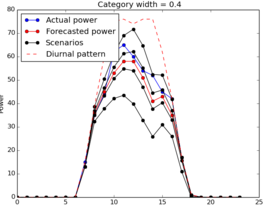 Named PRESCIENT, the software produces probabilistic forecasts automatically from deterministic historical forecasts for load, solar, and/or wind power production and their respective actuals, using a technology known as epi-splines. The software also generates probabilistic scenarios that are fed into the stochastic unit commitment engine. This allows stakeholders who have no access to probabilistic forecasts – or the expertise to generate them – to create an explicit representation of the uncertainty in the system load, solar generation, and/or wind generation. Because of this explicit uncertainty representation, reserve margins and production cost can be substantially reduced, even under high penetration of renewable energy. PRESCIENT’s stochastic unit commitment uses an efficient technique to solve hundreds of scenarios in tens of minutes using commercially available solvers. PRESCIENT also has visualization capabilities; it produces daily generation dispatch stack graphs and a cost breakdown of commitment and fuel costs. The software was developed using Pyomo, a python optimization modeling language developed at Sandia, and was supported by the U.S. Department of Energy's SunShot Initiative and ARPA-e GENI program. PRESCIENT was developed in partnership with the University of California-Davis. Graphic illustrates an example of a probablistic solar forecast produced with PRESCIENT. Sandia researcher Jeff Koplow has been selected as the inaugural recipient of the Innovator in Residence Fellowship by the U.S. Department of Energy’s SunShot Initiative. The program launched on October 1, 2015, and will provide Koplow and his team $500,000 per year for three years for innovative solar research aimed at supporting the SunShot goal of making solar cost-competitive with other forms of energy. Koplow is the recipient of four R&D 100 Awards, including one for the “Sandia Cooler.” He currently holds 10 active licenses on previous inventions and has given several invited talks on the subject of multidisciplinary technical innovation. The full story about Koplow’s Innovator in Residence award is on Sandia’s Energy & Climate website. Small clean energy businesses can now access research support at the U.S. Department of Energy’s (DOE’s) National Laboratories through the Small Business Vouchers Pilot (SBV), part of DOE’s Office of Energy Efficiency and Renewable Energy National Lab Impact Initiative. Through SBV, small businesses can be awarded vouchers of $50,000-$300,000 to be redeemed at select national laboratories, including Sandia, for work related to nine technology areas. The vouchers are intended to provide U.S.-based and -owned small businesses access to unique research skills and laboratory facilities, with the ultimate goal to move next-generation clean energy technologies to market. Sandia is the lead laboratory for SBV awards related to solar energy technologies. Additional laboratories supporting solar SBV projects are Lawrence Livermore National Laboratory, the National Renewable Energy Laboratory, and Pacific Northwest National Laboratory. SBV projects are being selected via a merit review process. The results of the first round of SBV proposals will be announced in mid-December. The second round of SBV proposals will be accepted beginning in February 2016, and a third round will commence in June. SBV projects require a 20 percent cost share and are subject to a range of eligibility requirements, including for-profit status. Additional information can be found on DOE’s Small Business Voucher Pilot website and in the site’s Frequently Asked Questions. Informational webinars about the program are also available. A paper co-authored by Sandia researchers was selected at the 2015 IEEE Power and Energy Society General Meeting as one of four “Best of the Best” papers at the conference. “Generic Wind Turbine Generator Models for WECC - A Second Status Report” describes the most recent updates to the Western Electricity Coordinating Council’s (WECC’s) generic wind turbine generator models developed by the Renewable Energy Task Force. Technical committees narrowed down the nearly 1,600 papers submitted for the General Meeting to 75 as “Best Conference Papers.” Judges then selected four papers from each presentation as “Best of the Best.” The winning papers were announced at the General Meeting Awards Dinner. Co-authors on the paper are Abraham Ellis (Sandia), Pouyan Pourbeik (WECC), Juan Sanchez-Gasca (Electric Power Research Institute), Jay Senthil (General Electric), and James Weber (Siemens). On September 22, 2015, Sandia researcher Brian Dwyer participated in a webinar hosted by the Interstate Renewable Energy Council (IREC) as part of its Solar Instructor Training Network (SITN) to discuss results from Sandia’s Structural Code Considerations of Solar Rooftop Installations and Empirically Derived Strength of Residential Roof Structure for Solar Installations. The reports detail research conducted by Sandia and funded by the U.S. Department of Energy’s (DOE’s) SunShot Initiative to test numerous wood rooftop structures to failure and compare actual rooftop load-bearing capacity data to the perceived load-bearing capacity in building. Results indicate that rooftop load-bearing capacity is higher than allowable loads as defined by the International Residential Code (2009). Dwyer, an engineer who participated in many of the rooftop tests, discussed results and implications with the SITN audience. Nearly 170 people representing more than 125 organizations in 35 U.S. states, Canada, and Mexico. The webinar is archived on the IREC website. SITN is funded by DOE’s SunShot Initiative and managed by the Interstate Renewable Energy Council. Sandia solar researchers are part of a research team led by the Electric Power Research Institute (EPRI) to develop novel accelerated aging protocols for solar photovoltaic (PV) modules. EPRI was awarded $1.3 million for the project through the Physics of Reliability: Evaluating Design Insights for Component Technologies in Solar 2 (PREDICTS 2) funding opportunity under the U.S. Department of Energy’s SunShot Initiative. The project will compare performance of actual PV panels that have been operating for a number of years to similar panels, ideally the same make and vintage, subjected to accelerated aging. The objectives of the project include development of an algorithm for predicting panel performance degradation and analysis of the potential improvement to levelized cost of electricity from improved degradation prediction. Sandia researchers will support analysis and evaluation of testing results for the project. Other partners include Southern Company and Southern Research. Sandia researchers are part of a team led by the University of Wisconsin–Madison to evaluate the potential for significant improvements in commercial viability of supercritical carbon dioxide (sCO2) Brayton power conversion cycles as an option for concentrating solar power (CSP) plants. The project is funded by the U.S. Department of Energy’s Concentrating Solar Power: Advanced Projects Offering Low LCOE Opportunities, or CSP: APOLLO, funding opportunity. Representatives from UW-Madison, Sandia, the National Renewable Energy Laboratory, FlowServe, the Colorado School of Mines, and Comprex will design, fabricate, and experimentally evaluate a 25-kilowatt thermal switched-bed regenerator system representative of that needed for a 10-megawatt electrical (MWe) power cycle to assess suitability with the high static pressures, differential pressures, and thermal performance required by the sCO2 cycle. The focus of the project is on the use of switched-bed regenerators for recuperative heat transfer within the cycle, an option that initial design estimates indicate could be less than half the cost of the current printed circuit heat exchangers. This recuperative heat transfer can be several times the duty of the primary heat exchanger, accounting for roughly 25% the cost of the overall cycle. Sandia will consult on the design and fabrication of a sub-scale unit and the 25-kWth unit, and will carry out experiments with the 25-kWth unit in Albuquerque, NM, at the Nuclear Energy Systems Laboratory. While the current project focuses on solar energy, the same advanced power cycle can apply to electricity generation with nuclear, geothermal, and fossil energy. Graphic illustrates a schematic of the team’s proposed switched-bed regenerator, to replace conventional recuperators. Researchers from Sandia gave a plenary talk on energy storage test protocols at the European PV Solar Energy Conference (EU PVSEC) in September in Hamburg, Germany. Plenary presentations are given to the entire conference and reserved for outstanding papers that are seen as visionary in the field. EU PVSEC 2015 hosted approximately 2,500 professionals from 79 countries. In the plenary, Sandia researchers discussed efforts to standardize interoperability certification protocols to validate distributed energy resource (DER) operation and communication within the power system. These protocols will provide evaluation of energy storage interoperability and functionality, resulting in frequency and voltage stability of DER in bulk and local power systems. The research is being conducted by Sandia and its collaborators in the Smart Grid International Research Facility Network (SIRFN)—Austrian Institute of Technology, Ricerca sul Sistema Energetico in Italy, and the National Institute of Advanced Industrial Science and Technology’s Fukushima Renewable Energy Institute in Japan. The associated conference paper discusses advanced energy-storage requirements in each SIRFN country as well as the development of harmonized interoperable storage testing procedures, and presents experimental results from the laboratories. Sandia solar researchers Josh Stein and Cliff Hansen were recently quoted in an article in Solar Professional magazine. The article, “PV Performance Modeling: Assessing Variability, Uncertainty, and Sensitivity,” details the importance of accurate solar photovoltaic (PV) system performance to system design, solar financing, power purchase agreements, and other project considerations. The article also reviews how models treat attributes such as irradiance and temperature, soiling, wire losses, the angle of incidence, and mismatch losses. Stein and Hansen discuss the development of future models and the importance of being able to compare models.